To learn about three different cardio workouts that will help clients burn fat and lose weight. To learn why the workouts are important. To learn how to do the workouts. Whether your clients are lawyers, soccer moms, or businessmen, they all want to make the best use of their workout time. Although organizations like the American Heart Association, the Centers for Disease Control and Prevention, and the American College of Sports Medicine recommend at least 30 minutes per day of moderate- to high-intensity aerobic exercise, many people lack the time or the inclination to meet these recommendations. If your clients have time for only a few cardio workouts per week, 15 or 20 minutes of steady-state cardio on the elliptical trainer or stationary bike at an intensity easy enough to allow them to read a magazine while exercising isn’t going to cut it. So, how can you make your clients’ cardio workouts more efficient and obtain the greatest benefit in the least amount of time? In order of intensity, below are the most effective cardio workouts for improving cardiovascular fitness and burning fat. What: As its name implies, LSD workouts are long, continuous aerobic workouts at a low intensity during which your clients cover a great distance. Why: LSD workouts target many factors associated with aerobic metabolism, increasing the number of red blood cells, hemoglobin concentration, muscle capillary and mitochondrial volumes, and aerobic enzymes. These cellular adaptations enhance fat oxidation at the same absolute exercise intensity, helping your clients to become better fat burning machines. In addition to burning many calories during LSD workouts, your clients’ metabolic rates remain elevated for hours afterward, continuing to burn calories. A number of studies have shown that the longer the exercise session, the more and longer metabolic rate is elevated afterward. A study published in Medicine and Science in Sports and Exercise in 1994 found that walking at 70% of maximal oxygen consumption (VO2max) for 60 minutes resulted in a higher post-workout metabolic rate than walking at the same intensity for 20 or 40 minutes (Quinn, Vroman & Ketzer, 1994). Also, the longer the subjects walked, the longer it took for their metabolic rates to return to pre-exercise levels, taking 2, 3.5, and 7.5 hours following the 20-, 40-, and 60-minute exercise bouts respectively. In another study published in Canadian Journal of Sport Sciences in 1988, post-workout metabolic rate more than doubled when the amount of time subjects exercised at 70% VO2max increased from 30 to 45 minutes and increased more than five-fold after exercising for 60 minutes (Chad & Wenger, 1988). How: Your clients can use almost any piece of cardio equipment in the gym to do LSD workouts, including a treadmill, bike, or rowing machine. They can also run or cycle outside or swim in the pool. The more muscles involved and the more weight-bearing the exercise, the more calories they’ll burn during the workout. Whichever mode of exercise they choose, have them do these workouts at about 65 to 70 percent maximum heart rate for at least one hour, increasing the length of time as their training progresses. What: Tempo workouts are performed at the intensity corresponding to your clients’ lactate threshold, an important physiological variable that demarcates the transition between exercise that generates energy almost purely aerobically and exercise that includes energy generated from both aerobic and oxygen-independent (anaerobic) metabolism. While your clients use both fat and carbohydrates for energy during exercise, these two fuels provide that energy on a sliding scale—as they increase their intensity up to their lactate threshold, the contribution from fat decreases while the contribution from carbohydrates increases. When they exercise at an intensity above their lactate threshold, they use almost exclusively carbohydrates. Why: Since tempo workouts are performed at the highest intensity your clients can maintain aerobically, these workouts are great for burning fat. Although the percentage of calories from fat is small when exercising at or slightly below their lactate threshold intensity, the total number of calories being burned per minute is much higher than at a lower intensity. Research has shown that exercising at or slightly below the lactate threshold intensity elicits the highest rate of fat oxidation (Astorino, 2000). And since these workouts are aerobic, fatigue is minimal, so your clients can complete other quality calorie-burning workouts during the week. In short, tempo workouts give your clients the best aerobic bang for their buck. 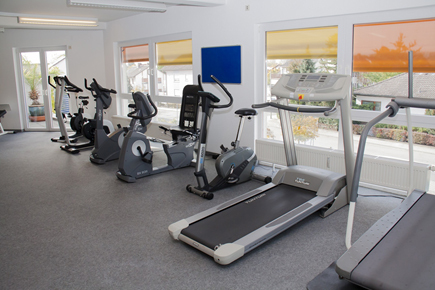 How: Like with LSD workouts, your clients can use any piece of cardio equipment in the gym for tempo workouts. To get the most from tempo workouts, they should be performed at the intensity corresponding to their lactate threshold. For unfit people, this intensity is approximately 75 percent maximum heart rate. If your clients are more aerobically fit, it’s about 80 to 85 percent max heart rate, and for those who are very aerobically trained, it’s about 85 to 90 percent max heart rate. Subjectively, these workouts should feel comfortably hard. Your clients can do tempo workouts continuously for about 15 to 20 minutes or as shorter segments (e.g., 5 minutes) with short recovery periods (e.g., 1 minute). What: In the 1960s, famous Swedish physiologist Per-Olaf Åstrand discovered that by breaking a set amount of work up into smaller segments, the whole set of work can be performed at a higher intensity. 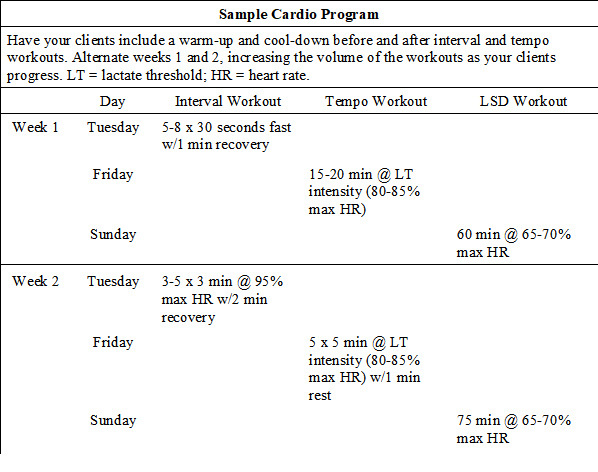 Interval workouts alternate high-intensity reps with low-intensity recovery intervals. There are four variables that can be manipulated within an interval workout: (1) time (or distance) of each rep, (2) intensity of each rep, (3) time of each recovery interval, and (4) number of reps.
Why: Cardio interval workouts are the most effective workouts your clients can do to get fit fast. Also, following intense exercise, the more and longer post-workout metabolic rate is elevated and the more calories burned subsequent to the workout. For example, a study published in Medicine and Science in Sports and Exercise in 1996 found that not only did subjects burn more calories during interval cycling (15 x 2 minutes at 100% VO2max with 2 minutes rest) compared to continuous cycling (60 minutes at 50% VO2max), they also burned more calories during the 24 hours following the exercise (Treuth, Hunter & Williams, 1996). Other studies, in which subjects ran instead of cycled, have used different interval workouts (e.g., 6 x 3 minutes at 90% VO2max with 3 minutes recovery at 30% VO2max or 20 x 1 minute at 105% VO2max with 2 minutes rest) and different continuous runs (e.g., 36 minutes at 60% VO2max or 30 minutes at 70% VO2max), but still found that the interval workout resulted in a higher post-workout metabolic rate (Laforgia, Withers, Shipp & Gore, 1997). How: Your clients can do interval workouts on a treadmill, bike, rowing machine, or outside on a running track. For long interval workouts, have your clients run, cycle, or row for 2 to 4 minutes at 95 percent maximum heart rate with recovery intervals equal to or slightly less than the time of the reps. Have them repeat each hard-easy cycle three to five times. For short interval workouts, have them run, cycle, or row at slightly less than an all-out sprint for 20 seconds to one minute with recovery intervals two to three times as long as the time of the reps. Have them repeat each hard-easy cycle five to eight times (see Sample Cardio Program). Time is a valuable commodity. If your clients don’t have the time for cardio every day but still want to improve their cardiovascular fitness and lose fat, have them try these three cardio workouts. And with all the time they’ll save, they’ll even be able to watch their kids at soccer practice. Astorino T.A. (2000). Is the ventilatory threshold coincident with maximal fat oxidation during submaximal exercise in women? Journal of Sports Medicine and Physical Fitness, 40(3),209-216. Chad, K.E. and Wenger, H.A. (1988). The effect of exercise duration on the exercise and post-exercise oxygen consumption. Canadian Journal of Sport Sciences, 13(4),204-207. Laforgia, J., Withers, R.T., Shipp, N.J., and Gore, C.J. (1997). Comparison of energy expenditure elevations after submaximal and supramaximal running. Journal of Applied Physiology, 82(2),661-666. Quinn, T.J., Vroman, N.B., and Kertzer, R. (1994). Postexercise oxygen consumption in trained females: Effect of exercise duration. Medicine and Science in Sports and Exercise, 26(7),908-913. Treuth, M.S., Hunter, G.R., and Williams, M. (1996). Effects of exercise intensity on 24-h energy expenditure and substrate oxidation. Medicine and Science in Sports and Exercise, 28(9),1138-1143. How Does Weight Loss Reality TV Affect Your Clients?